Earlier today I made a blog post about a "Kill Mitt Romney" page that I came across on Facebook. Thanks for your recent report of a potential violation on Facebook. 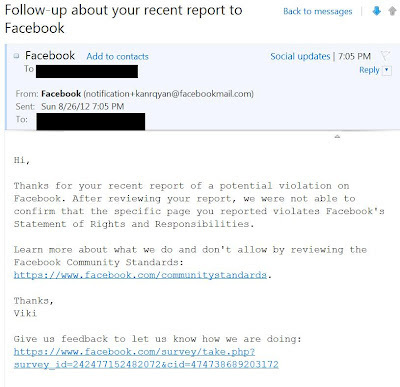 After reviewing your report, we were not able to confirm that the specific page you reported violates Facebook's Statement of Rights and Responsibilities. Learn more about what we do and don't allow by reviewing the Facebook Community Standards: https://www.facebook.com/communitystandards. I wonder how long a "Kill Barack Obama" page would last on Facebook? I wonder how long a "Kill Mark Zuckerburg" page would last on Facebook? A commenter had suggested earlier today to report the "Kill Mitt Romney" page to the Secret Service. If you wish to do so, you can do so HERE via Twitter. Since Facebook doesn't currently seem to have any problems with the "Kill Mitt Romney" page, perhaps they will after the Secret Service talks with them. I don't know what part of that is not clear for Facebook. This page is openly advocating for the MURDER of a presidential candidate! And Facebook says it doesn't violate their standards!?!?! Safety is Facebook's top priority. You may not credibly threaten to harm others, or organize acts of real-world violence. Is this a simple understanding or does someone stating that they are "advocating for the murder of Republican Presidential candidate Mitt Romney" not qualify as a "credible" threat to Mitt Romney and therefore violate Facebook's "standards"? Again, I wonder how many seconds a "Kill Barack Obama" Facebook page would remain on Facebook? I gave Facebook my feedback and let them know how they are doing (as they requested in that email above) - I sent this blog post to them. There is a new Facebook page entitled "Remove the Kill Mitt Romney Page" - click the link and "Like" this new page on Facebook.